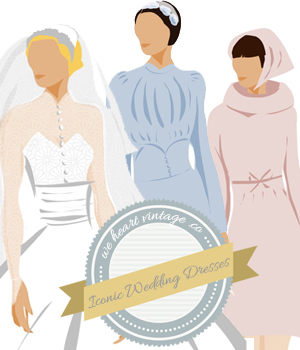 There are a lot of different definitions for the word vintage: people use the word vintage to refer to anything from 2nd hand thrift-shop clothes to retro-inspired fashions, but what does it really mean? Anyway, enough semantics, pick your favourite decade and get browsing! The Victorian era, a time of corsets and crinolines, the Yorkshire Ripper and when Arthur Conan Doyle wrote the Sherlock Holmes mysteries. The Edwardian decade marked the last of corset-wearing fashions, a sleeker silhouette and the start of great social change. The decade between the Edwardian era and the start of WW1 which laid the basics for the roaring 20s. The corset disappeared, hemlines rose and long hair was bobbed short for the first time. Flappers with sleek bobs, cupid blow lips, long strings of pearls and lots and lots of sass, the roaring twenties were the place to be! In between the 2 world wars the bright young things of the nation really let rip! A decade of Hollywood-inspired sophistication and grown-up glamour sandwiched in between the decadence of the 1920s and the war-enforced austerity of the 1940s. The hardships which were caused by a world at war dictated the fashions of the 1940s. Once again Hollwood had a major influence of the style of everyday women who were encouraged to look good despite rationing and shortages to keep up morale. After the hardships of the wartime years, the 1950s exploded in a riot of colour. Women embraced the hourglass figure of Christian Dior’s ‘New Look’ and wore big petticoats to make their skirts larger, and for the first time teenagers developed their own fun sense of style. Charlie’s Angels, bell-bottom jeans and the Farrah Flick, not to mention the decade of corduroy, velvet and rainbow-patterned roller boots. Power dressing, Dynasty and Joan Collins in those huge shoulder padded dresses.